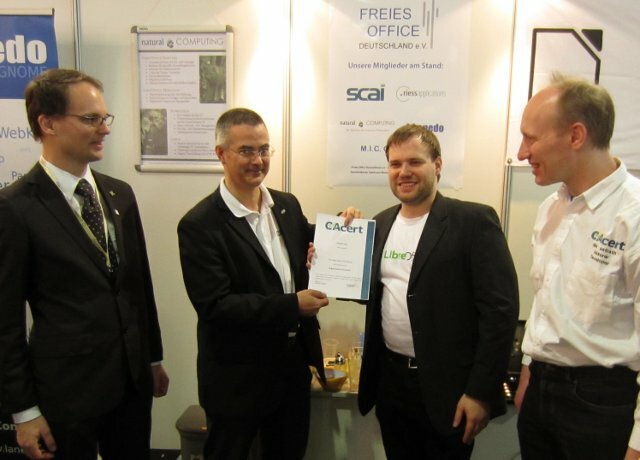 At the CeBIT 2012 booth in Hannover CAcert was able to handover the Organisation Account (OA) for “The Document Foundation”. The Document Foundation is dealing with financial and legal cases on behalf of the open source project LibreOffice. Picture (Martin Gummi): from left. Thorsten Behrens, Deputy Chairman TDF; Marcus Mängel, CAcert Organisation Assurance Officer; Florian Effenberger, Chairman of the board TDF; Dirk Astrath, Executive Board Member CAcert. This entry was posted in Information, News and tagged Organisation Assurance on 2012-04-11 by alexb.